Hunslet Engine Co. 4208 is pictured at Rolvenden, on the Kent & East Sussex Railway on 27 May 1991. Despite appearances, this is not an 0-4-0 loco with a very wide wheelbase, but an 0-6-0 with a missing centre pair of wheels! Note the connecting rod lying next to the engine room doors. Built in 1948, its last working location was the Pitstone Cement Works. This side view clearly shows both the current number (42) and the previous and rather crudely painted out number (28). 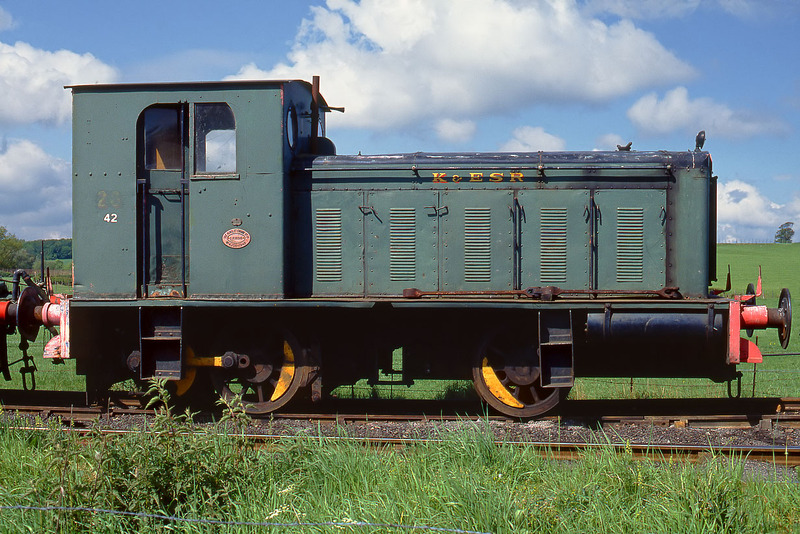 If you think the loco looks in a bad way here, it got considerably worse, and was eventually sent for scrap in 2001.